“Fine,” said Alisha, picking up her fork and finally eating them. “I guess not,” said Alisha. “Where are we going?” asked Alisha. “We are going to visit Uncle Fred,” said Mother. “He wouldn’t tell me,” said Mother. Alisha was very excited. Usually when Uncle Fred had a surprise for her, it was a new baby animal. All the way to the farm, she wondered about what kind of baby animal she was going to get to see this time. Alisha gave Uncle Fred a big hug once they arrived. “Come with me,” said Uncle Fred. Uncle Fred took Alisha by the hand and they walked down to the barn. Alisha did not finish her question once Uncle Fred opened the barn door. In fact, she couldn’t say a word. There, standing right in front of her, was her idol, Christopher Corn. “This is where Loud Garden practices explained Uncle Fred. Alisha spoke with Christopher about Loud Garden and then she asked him what it was like to be a real life veggie. “It is actually pretty cool,” said Christopher. Example: Alisha thought that because Christopher was a real life veggie that she wouldn’t eat veggies anymore. 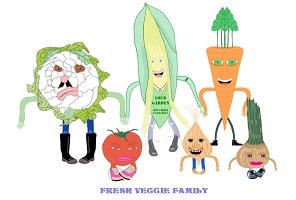 This entry was posted in Fresh Veggie Family Stories, Grade 3 Level, Summer Stories, Summer Story Challenge 2017 and tagged barn, Christopher Corn, Eat Your Veggies, Farmer Fred, friend, garden, surprise, visit. Bookmark the permalink.